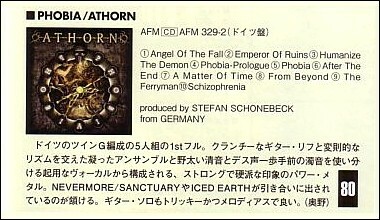 ATHORN is a power metal band from Germany. They have released the album PHOBIA from AFM Records last October. They are one of Europe's most promising new bands. Aside their professional attitude and high-quality musicianship, Athorn are a prime example of intelligent Metal and walk the earth without blinders. Combining a sound that includes elements of traditional Heavy/Power Metal, it's unmistakable that ATHORN are currently one of the most innovative bands from not only Europe, but the world over. 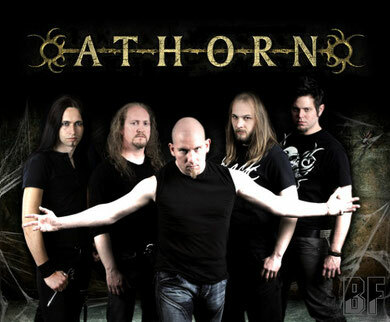 Their unique mixture of heavy riffs, varied vocals, progressive elements and melody is hard to compare to other contemporary Metal bands and Athorn stand unique in their own right. 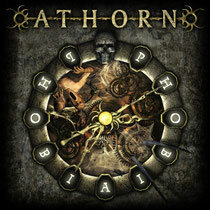 Every fan of innovative and powerful Metal music with it's own identity will absolutely love PHOBIA. A must-have! When they see the review on BURRN! below, they told us with honesty they wanted some more points on that. We would say we need to add 10 more points on that score, because they deserve it.